"I will carry the spirit of Madiba to Miss World 2014"
An excited and emotional Miss South Africa, Rolene Strauss, had her official Miss World sendoff in Johannesburg today. The gorgeous 22 year old thanked the South African public for their unwavering support. Strauss has proven herself to be one of the most popular Miss South Africas ever and she has a nation excited about the possibility of our first Miss World title in 40 years. South Africa's Penny Coelen won the title in 1958. Anneline Kriel was second in 1974 but took over the title when the original winner stepped down. Now, forty years later, South Africa is one of the hot favorites to win this year's Miss World title. Strauss presented her national costume and opening gown to the media this morning. 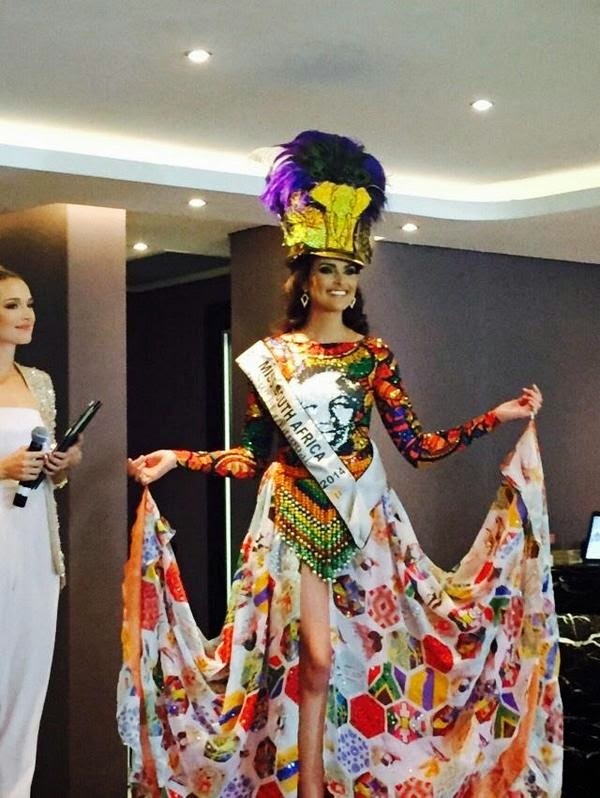 Her national costume was designed by the Cape Town School of Fashion. It pays homage to South Africa's beloved former president, Nelson Mandela, who passed away last December. Strauss said she is proud to represent the bornfree generation of South Africans who celebrate 20 years of democracy this year. She will take a framed picture of Mandela with a piece of fence from the Robben Island prison to London as her national gift. Her opening gown was designed and crafter by talented designer Casper Bosman. The stunning mint gown is adorned with more than 13,000 Swarovski crystals, sequins, and pearl embroidery. It took 15 people to create this masterpiece. Bosman said the gowns he designed for Strauss were inspired by her timeless elegance and beauty. Strauss' gown for the final event will be kept secret until the night of the Miss World final. As she prepares to embark on this once-in-a-lifetime adventure, an ecstatic Strauss thanked the South African public for their unbelievable support. "Thank you for every like, comment, tweet! It's those small things that keep me going!" the beaming beauty told the crowd. 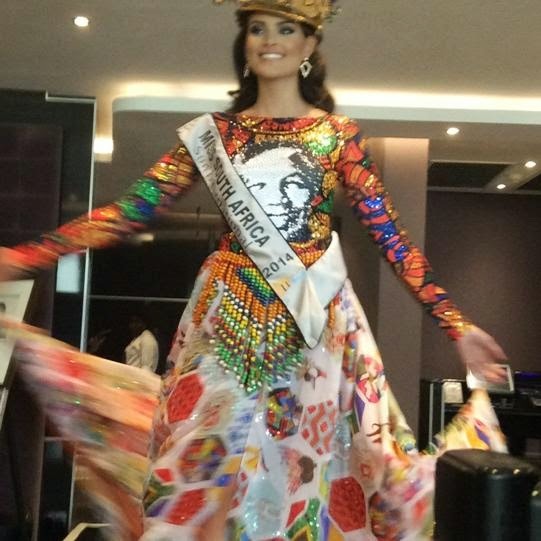 She also thanked her family for their support, and the Miss South Africa Organization for making this dream come true. Thank you to Volksrust and South Africa! I will bring the crown home for YOU!" I believe that Rolene is more ready for Miss Universe based on the evening gown shown... But she is gorgeous!!! Well I hope she is sincere about preferring MW and is not just saying that to please Julia Morley.